Effect: You predict the numbers on two dice. Secret: On a postcard write the numbers four and five. Place the card in an envelope. 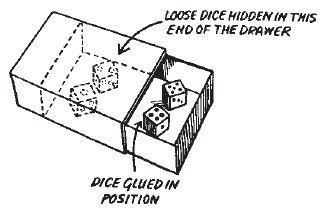 Glue two dice in one end of the drawer of a large matchbox with the four and five spots uppermost. Put two loose dice in the other end of the drawer. Open the matchbox to show the loose dice. Close the drawer and ask a spectator to shake the box. Take the box back and open the drawer at the end containing the glued dice. Allow someone to see the dice then close the drawer. Your prediction is opened and it, of course, correct.